And the Award Goes To…The GlobalSign IoT Identity Platform! Strong, unique identities are the core of IoT device security. Giving unique identities allows them to be authenticated when they come online and throughout the lifetime. It proves integrity and securely communicates with other devices, services and users. But how do you know what’s the best of the best? 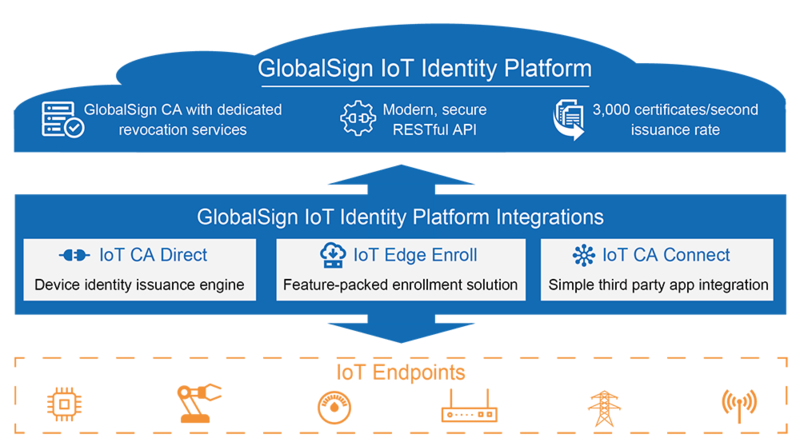 In the true spirit of an “awards season” that just passed, we think it only makes sense to unveil one more: The market’s pick for best in IoT Security – The GlobalSign IoT Identity Platform! In fact, we just took home a 2019 Silver Cybersecurity Excellence Award – recognizing companies, products and individuals demonstrating excellence, innovation and leadership in information security. We believe the IoT Identity Platform stands out for an ability to address critical device security requirements. No other product today protects the identity, integrity and privacy of devices and data from chip to cloud through authentication, authorization, and encryption – while staying highly scalable. This is especially true due to the platform being a high volume, high throughput infrastructure, capable of issuing 3,000 certificates per second and enabling customers to validate Proof of Concept with low-volume test certificates – then scale to millions of identities using the same RESTful API. The IoT Identity Platform can manage all types of digital certificates in any market vertical or IoT Gateway – semiconductor, industrial manufacturing, automotive, smart grid, agriculture, healthcare, construction, logistics and more. The central feature is IoT Edge Enroll, a full-fledged enrollment client used to provision and manage PKI-based identities to IoT devices of all types. The main function is a Registration Authority with an embedded GlobalSign CA Root of Trust, whitelisting, challenge-response, and policy-based management. Edge Enroll also includes connectors for hardware security modules (HSMs), and can be deployed in a public or private cloud, on-premises, or as a GlobalSign managed service. The offering supports an expanded list of enrollment and communication protocols in response to flexibility required by IoT ecosystems. It backs PKCS #7, #10 and #12, can accommodate batching of certificate/requests, and performs private key generation and key escrow. The solution uses secure TLS communication, IP address whitelisting and integrates with secure elements such as Physical unclonable function (PUF), Trusted Platform Module (TPM), and STSafe (Secure STMicroelectronics microcontroller). Even better, our solution is also being leveraged across a broad range of industries. Just last April, the platform was integrated with the Arm® Mbed™ Cloud platform – allowing any third-party developer using Mbed Cloud to quickly automate issuance of digital certificates from GlobalSign, along with certificate management services. This also ensures every Mbed supported device can have a unique device certificate from a trusted third party such as GlobalSign. Last year, we also began working with Longview, a Carnegie Technologies company as it began packaging its newly launched industrial IoT asset management solution. Their development team took an approach that included four key areas: security by design, multiple layers of security, securing the supply chain and partnering for success. Ultimately, Longview IoT packaged the right IoT technologies – including GlobalSign’s IoT Identity Platform — to provide customers with a single, secure, and optimized solution to monitor and manage industrial assets. It delivers end-to-end IoT solutions, pre-configured for various industries and designed to work right out-of-the-box. The explosion of IoT connected devices is staggering. Although technology has improved manufacturing, enhanced decision-making and improved the safety, comfort and efficiency of our lives – it’s also created the largest attack surface ever. GlobalSign’s IoT Platform rises to this challenge of securing IoT by protecting identity, integrity and privacy of devices and data – from chip to cloud through authentication, authorization and encryption. You can read the original article, here.